If you have any questions about travelling to Dubai Airport then the best way to contact us is via our Facebook page. Feel free to ask us anything you like or share your experience and any knowledge you may have with regards to travelling through the airport as this will help others! Dubai International Airport is the main airport of the Emirate of Dubai which is the largest city in the United Arab Emirates. The Airport is situated in the district of Al Garhoud which lies around 4km or 2.5 miles southeast of Dubai city centre. 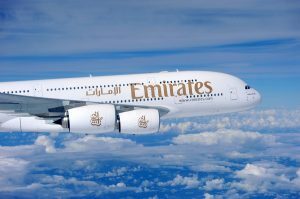 Dubai Airport is where the home base for Emirates is located which actually handles around 60 percent of all passenger traffic. The dedicated Emirates hub at Terminal 3 is the largest within the Middle East & Africa. Budget carrier Flydubai also has their base at the airport which handles around 10 percent of passenger traffic at DXB. Below you will find the main sections we have covered to create a comprehensive guide to Dubai International Airport. Scroll down through the page to see the various sections or simply use the navigation menu at the top of each page to find your way around our guide to Dubai Airport. There are 15 major car hire companies based at Dubai International where you will be able to find the vehicle you are looking for aswell as meet with any particular requirements that you may have. We have a dedicated page on each of the car hire firms, for further details simply use the navigation icon on the left or the car hire menu at the top of the page to go through to each of the Airport car hire pages. With over 5,600 flights per week operating from Dubai there is an extensive selection of flights to the Airport from all over the world. We provide details of all the flights available and also provide a very useful search engine where you can instantly check flight times, prices and also book your tickets online direct with the airline company. Our dedicated section on flight arrivals provides all the information you could possibly need regarding arrivals including a live flight arrival information screen. You will also find information regarding Dubai Visa requirements and what facilities are available for passengers arriving at the airport. For detailed information regarding flight departures simply use the icon on the left to discover everything there is to know about departures and to check the live flight departures information screen. If you would like to know where to get something to eat or drink at the Airport before your flight departs then simply have a read through our dedicated section on Bars & Restaurants. Dubai Airport consists of various Terminals and Concourse buildings. In this section you will find information on the different Terminals & Concourses including a page on Terminal 3 which is exclusively used by Emirates. See our page on buses for information on the bus services available and for details on timetables, fares, hours of service and bus routes. This section also includes details on the Dubai night bus, the Dubai Inter Emirates Bus service and new bus routes for Dubai International Airport and the Dubai Metro. Our section on the Dubai Metro contains plenty of useful information including the hours of service, timetables, interactive maps and a useful table with information on Dubai Metro ticket prices and fares. Taxis are available 24 hours a day and the taxi ranks can be found directly outside each of the Terminal building arrival areas. The taxis are provided by the government owned Dubai Taxi agency. If you would like information on private transfers take a look at our page on Airport Transfers. Our section on Car Parks includes information for both short term car parks and long term car parks located at the Airport. We also provide information on car parking tarriffs for all 3 terminal buildings and details on disabled car parks. Passengers are literally spoilt for choice when it comes to the number of passenger services available at the Airport. We have created a dedicated section specifically for passenger services where you can discover everything that is available to passengers from the various dining outlets, business centres, hotels, spas, gyms, prayer rooms and much, much more. Dubai Airport duty-free was recently declared as the number 1 airport retailer in the World with recorded sales of well over US$1 billion last year. We provide an in depth guide to shopping which includes information on duty free allowances and a list of all the retailers based at the Airport. If you are planning on having something to eat or drink at the Airport then visit this section where we provide details on the various bars and restaurants to choose from. Information includes where the different establishments are situated within each of the terminal buildings. If you are looking for a guide to driving in Dubai then take a look at our page on maps and driving directions which provides useful tips and directions to the various tourist locations in and around Dubai and the United Arab Emirates. Use the Interactive map to plan your route and to find out how long it will take you to travel to your destination in Dubai. Here we have provided you with a detailed guide to the Dubai International Hotel which also includes information on all the magnificent hotels based close to the Airport. We also provide information on the various types of hotel rooms that are available at the Hotel and offer a hotel search engine where you can book your hotel room within minutes. If you would like to experience the highlights of Dubai, there really is no better way to do it than a fully guided sightseeing tour of Dubai. Our dedicated sections on Tours in Dubai and Things to do in Dubai will allow you to discover a wide range of sightseeing tours and also allow you to book your tour online. We also provide information on many other hotels in Dubai. Take a look at our section on Hotels which includes a list of the most popular 5 star, 4 star, 3 star and 2 star hotels in Dubai. If you would like to find out what the weather is like throughout the year in Dubai and specifically what kind of climate you can expect to find when you plan to visit then visit our guide to Dubai Weather for all you need to know. We also have a dedicated page on the monthly weather in Dubai which has details on what the climate is like for each month of the year.